Product prices and availability are accurate as of 2019-04-26 05:17:14 EDT and are subject to change. Any price and availability information displayed on http://www.amazon.com/ at the time of purchase will apply to the purchase of this product. 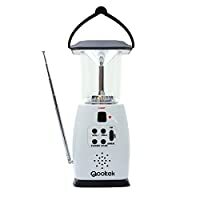 The Qooltek Solar Dynamo LED Lantern with FM radio is a good tool when you have camping outdoors, making your camping more convenient and joyful. And it can also be used during a power outage at home or in an emergency situation, such as a hurricane or an earthquake. Made of durable, high-impact plastic, this rugged device can be powered on by 4 different sources, ideal for camping or emergency situation. - The built-in batteries can be fully charged under the direct sunlight for 15-25 hours. - Please turn the hand cranks over 120 revolutions to ensure Li-battery in good condition and make the product feature is turned off after use. - When hand cranking to charge, please make sure all the function is turned off, especially charging for the mobile phone or other digital products. - Please take out the dry batteries when unused.
? 4 Charging Ways - hand crank to wind up internal alternator, expose to sunlight to charge by solar panel, DC recharge by connecting the mini USB cable to computer, installing 3 * dry batteries(not included) to charge. ? 8-LED Lantern - Comes with super bright LED light of 2-level brightness adjustment to give extra convenience in darkness. ? FM Radio and Siren - Good signal FM automatic search radio with emergency alarm siren for asking help. ? 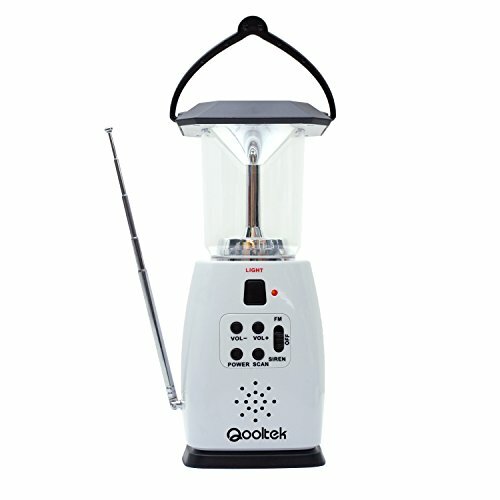 Emergency Power Bank - Turn off the lantern and radio, connect the USB device like cellphone, hand cranking for charging to help out of power exhaustion. ? Multipurpose Use - Suitable for outdoor activities like camping and hiking, emergency preparedness, home and office entertainment or power outages, disaster area rescue ¨C Gift Idea.